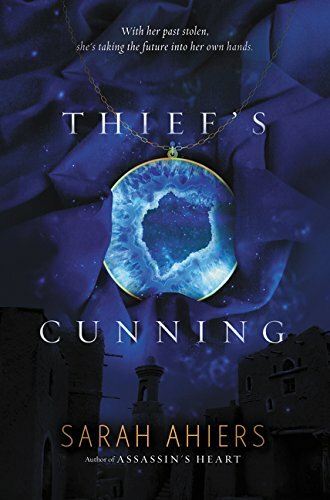 Set 18 years after Assassin's Heart, Thief's Cunning is less a sequel and more a separate book in the same world. The characters of the first book are secondary here and are the ones who set young assassin Allegra Saldana on her own path—mostly by lying to her about who her true parents were and what her place is in the world, though they do it out of love. But she wants to be free to make her own decisions and build her own life, which leads to her uncovering just enough answers to start making rash decisions. And then she meets a traveler boy who literally changes everything. It's a fun story part family secrets drama, part romance, and part fantasy leaning toward epic. The first half is set in a world like Renaissance Italy during a festival, and then the second half is set out in a foreign land full of ghosts and god-magic, and the contrast is well-drawn and interesting. Both are not too overused in the genre, so they feel fresh and new. Figuring out how both places work is worth Allegra's semi-random jumping into trouble, and behind it all, there's a very cool battle between gods that are real and present and have very definite affects on the world and the people. Especially on Allegra, who, through no fault of her own—mostly because no one explains things to her ahead of time—winds up in the middle of a jealous power struggle between the god of her home and one of the traveler's three gods. Effectively, between death and murder, and love and safety. Assassins are popular in YA right now, but this one feels just enough different to stand out. Allegra is good at killing, confident in her skills and her ability to win a fight, but she's also practical and smart and can figure things out—when she gets past her emotional first reactions. Nev, the traveler boy whom she woos for a night and winds up accidentally kidnapped by, is probably one of the sweetest YA love interests around, while being strong and steady and willing to make hard choices on the off chance that it might improve a not-very-nice situation. Both of them are trapped by their families and their pasts, and them coming to understand each other is also, partly, the story of their cultures finding common ground and their gods working out their issues. It could have gone on for another hundred pages and really fleshed out those themes, but it didn't and it only feels a little shorted. The worldbuilding feels like it wants expanding—perhaps in another book?—but the characters and their emotional arcs feel complete and complex enough to stay engaging without slowing the pace of the story. All in all, it's a fun story, not too deep though it may be setting up for deeper stories later, with fascinating worlds and fleshed-out characters playing off each other in interesting ways. Allegra is rash, as she admits herself, but she's also been specifically kept from information that would help her make better decisions, and it makes her impulsiveness less of a failure of decision making and more of a symptom of her situation—which makes her more sympathetic overall. As does the fact that the book stays close to her thoughts, so we understand everything she does on an emotional level, and that she's nicely aware of her own motivations. She works through her problems herself, mostly, taking responsibility for what she's done and the choices she's made, even when she doesn't want to. She doesn't back down, and it makes her an ideal fantasy heroine.